FREE pony rides, petting zoo, S’mores, trackless train, inflatable bounce house, and numerous crafts and activities. Santa will be on hand to hear wishes. Magic Moment Photography will be available to capture the memory for a small fee. Christmas In Grayson Tree Lighting and Festival - An afternoon of family fun - Christmas Carols, S'mores, pictures with Santa ... and much, much more! The City of Grayson Offices will be closed on Thursday, December 31, 2015 and Friday, January 1, 2016 in observance of the New Year's Holiday. We wish you all a happy and prosperous 2016! The City of Grayson Offices will be closed on Thursday, December 31, 2015 and Friday, January 1, 2016 in observance of the New Year's Holiday. The Mayor, Council, and staff wish you a happy and prosperous 2016! The Informational meeting for Grayson BOOST has been postponed. Main Street Grayson wants to give our businesses a BOOST! We'll try to answer all your questions and help you to be part of this community effort to keep our local businesses strong! The City of Grayson offices will be closed in observance of Good Friday. Please join us for an informational meeting discussing Grayson BOOST. We will be discussing contributions for investments as well as the application process for those seeking grants. You may find more information about the BOOST initiative HERE. Grayson Farmers' Market - Every Wednesday from June through September from 3:30 p.m. until 7:30 p.m. Grayz'n'Bluz will be in the pavilion serving up the music, while our food vendors will be on hand serving up dinner while you do the most stress-free shopping for the freshes products in the county at the AWARD WINNING Grayson Farmers' Market! And did we say there will be DINOSAURS??? YES! There will be dinosaurs in the park on opening day! BIG DINOSAURS! Please check our Facebook page for updates on the freshest produce, entertainment, and special activities throughout the season. 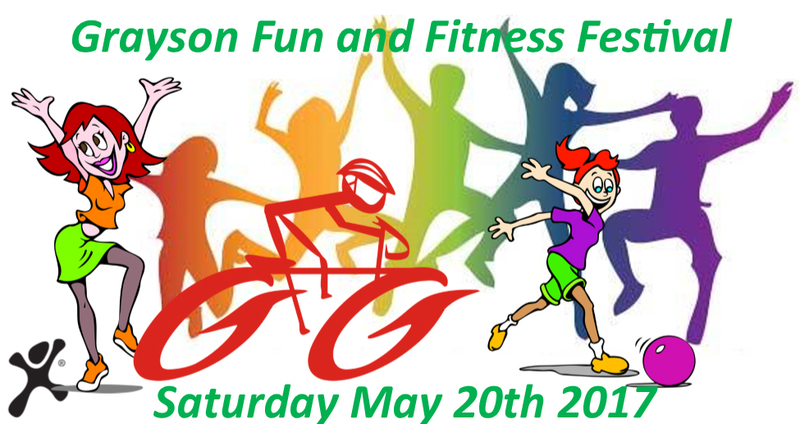 The Heart of Gwinnett and Greater Eastside Chamber of Commerce brings their Spring Green fun to Grayson this year! Craft vendors, family fun, and lots and lots of entertainment and festival food! Grayson Farmers Market - Connecting, Friends, Food, and Farmers - Live entertainment with the Grant & Moe Show with Buddy on Bass. 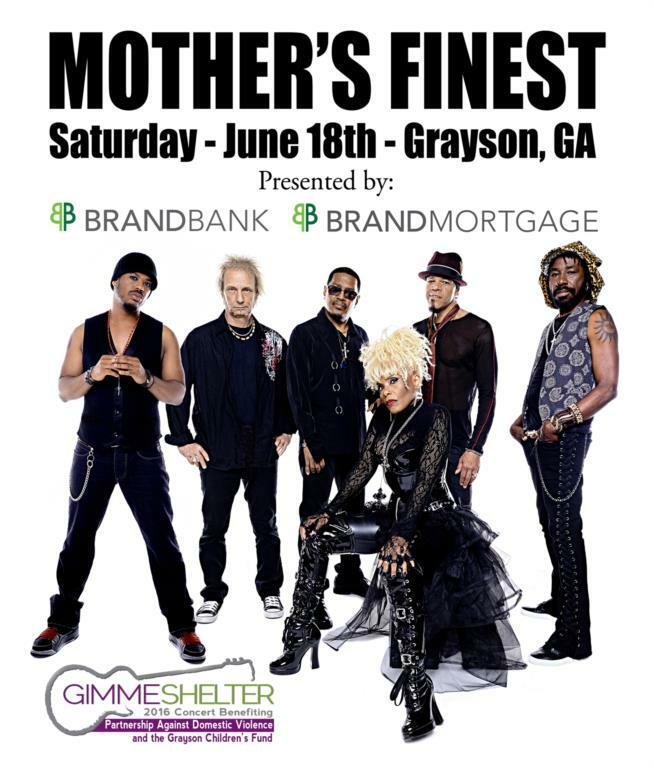 Gimme Shelter Benefit Concert will feature Mother's Finest in Grayson Community Park. The Crosstown Allstars will open for Mother's Finest in this concert to benefit the Partnership Against Domestic Violence and the Grayson Children's Fund. Grayson Farmers Market - Connecting Friends, Food, and Farmers - Live entertainment by the "Epic Journey Band" beginning at around 6:30 p.m.
Grayson Farmers Market - Connecting Friends, Food, and Farmers - Storytime in the Pavilion beginning at 6:00 p.m. Sponsored by the Gwinnett County Library. Arts - Crafts - Music throughout the day - Food Vendors - Fun for the Family! There will be a Public Hearing to receive comments on the proposed 2016-2017 budget on Monday, August 8, 2016 at 6:00 PM at Grayson City Hall. The proposed budget will be available to the public at Grayson City Hall, 475 Grayson Parkway, Grayson, GA 30017 on Monday, August 1, 2016. The public is invited and encouraged to attend these meetings. Grayson Movie In The Park - The Good Dinosaur - movie starts at dusk! Flu Shot Clinic from 9-12 while supplies last. $5 or 5 canned/boxed food items. All donations of cash or food will benefit the Southeast Gwinnett Co-Op. Join us for FREE Yoga In The Park - 7 p.m. in the Grand Pavilion. Join us for FREE Yoga In The Park - 7:00 p.m. under the Grand Pavilion. Our 6th Annual Blues & Brews Craft Beer Festival! More than 150 craft brews and the best blues in Gwinnett! Join us for FREE Yoga In The Park - 7 pm under the Grand Pavilion. Greater Eastside Chamber of Commerce Hot Tamale Chili Cook-Off from 10 a.m. to 4 p.m. Chili, vendors, fun for the whole family! Join us at the City of Grayson flagpole for a ceremony to commemorate Veterans' Day. Veterans are invited to join us in the Senior Center for light refreshments at the conclusion of the ceremony. Join us for an afternoon of family fun as we ring in the Season with Christmas music provided by area choruses and choirs, crafts and games for the kids, and visits with Santa! The City of Grayson Offices will be CLOSED in observance of the Christmas Holiday on December 23rd and December 26th. The City of Grayson offices will be CLOSED on December 23rd and December 26th in observance of the Christmas Holiday. Grayson City Hall will be CLOSED in observance of New Year's Eve. The City of Grayson Offices will be CLOSED in observance of New Year's Holiday. Join us for a walk with Mr. Berryl Budd from the Georgia Forestry Commission to learn about the trees of Grayson! Then you're invited to join Cub Scouts from Pack 499 as they plant dogwoods near the Arts & History Center to commemorate Arbor Day 2017! Grayson City offices will be closed in observance of Good Friday on April 14, 2017. The City of Grayson offices will be closed in observance of the Memorial Day Holiday. All the freshest locally sourced veggies, fruits, baked goods, and personal products ... and dinner in the park! Let's get healthy this summer! The freshest, locally sourced produce, baked goods, and personal products ... and Dinner in the park! The freshest locally sourced produce, baked goods, and personal products - and Dinner In The Park! All the freshest produce, baked goods, and personal products - and Dinner In The Park! It's the peak of the harvest - tomatoes, peaches, squash, cucumbers ... and a plethora of great baked goods straight from kitchens in our community! And don't forget dinner in the park! Join us for the best locally sourced freshest produce, baked goods and dinner in the park! Join us in the park for the very best of this season's locally sourced produce, baked goods, and dinner in the park! 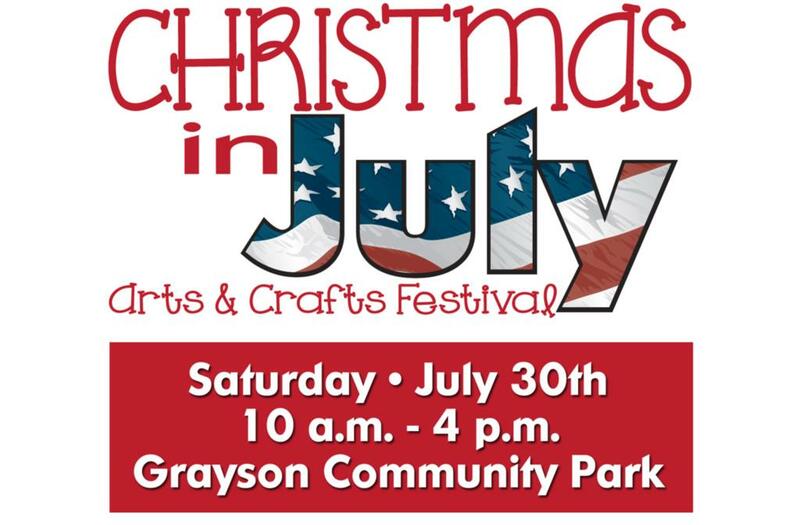 2017 Christmas in July Arts & Crafts Festival - We believe that the spirit of Christmas resides in Grayson throughout the year! Join us for a day of crafts, festival food, holiday tunes, and SANTA! Yoga in Grayson Park - Free for all ages. Click here for updates and information. Yoga in the Park for All Ages - Click HERE for information and updates. Graystone Church's "Party In The Park"
Yoga in the Park - Free for all ages! Click HERE for updates and information. Grayson Farmers' Market - 8/16/2017 featuring the Grayson High School Drum Line! Yoga in the Park - Free for all ages. Click HERE for updates and information. 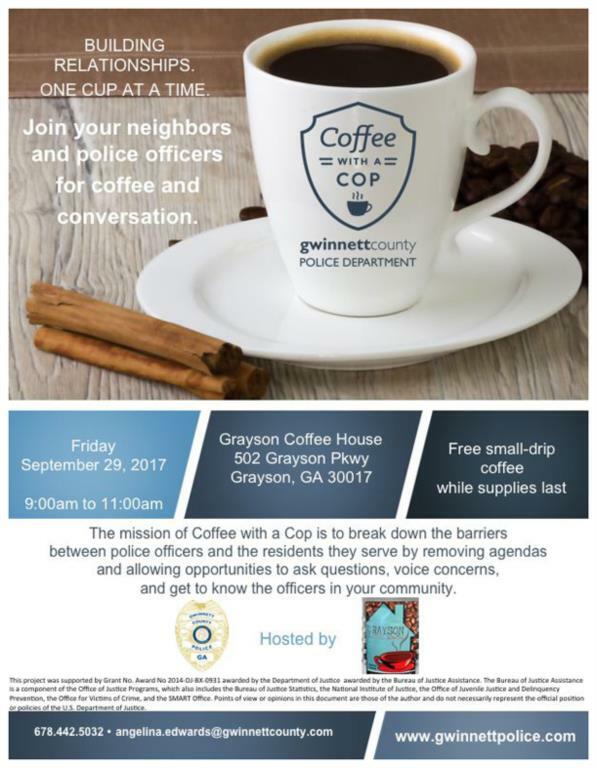 The mission of Coffee with a Cop is to break down the barriers between police officers and the residents they serve by removing agendas and allowing opportunities to ask questions, voice concerns, and get to know the officers in your community. 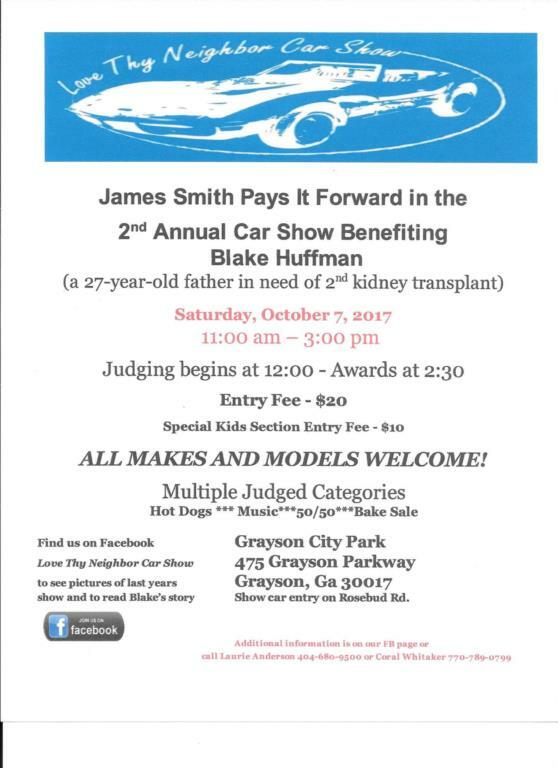 2017 Love Thy Neighbor Car Show Organized by members of our community with a goal towards making a difference in our community, the Love Thy Neighbor Car Show will bring some of the hottest hot rods and most fantastical vintage cars to Grayson Park for an afternoon of fellowship and fun! Council Work Session - October 9, 2017. Sponsored by Dr. Sangita Sharma of Grayson Primary Care and the City of Grayson. $5.00 or five canned food items per person while supplies last. Proceeds to benefit the Southeast Gwinnett CoOp.